Bust out your chainsaws! Or if you're on the wrong end of things, some running shoes might be appropriate, because Leatherface is coming. The long-delayed Texas Chainsaw Massacre prequel is finally getting released next month and now we have a brand new green-band trailer to check out, which gives us a much better idea of what to expect in terms of story. This Leatherface trailer may be green-band, but it is not in any way shy about presenting us the violent mess that this movie is going to be. The new green-band trailer for Leatherface comes to us from Entertainment Weekly ahead of the movie's release. Lionsgate is first releasing the movie on September 21, 2017, where the movie will be made available exclusively on DirecTV. Leatherface will then see a limited theatrical and full VOD release on October 20, just in time for Halloween. Considering that this movie has reportedly been done filming for a very long time, it is good for horror fans that this thing is finally going to see the light of day. The cast for the movie includes Stephen Dorff, Lili Taylor, Sam Strike, Sam Coleman, and Vanessa Grasse. In Leatherface, the youngest child of the infamous Sawyer family is sentenced to a mental hospital after an incident that he may or may not have been involved in leaves the sheriff's daughter dead. A decade later, the young member of the Sawyer family kidnaps a young nurse and escapes the mental hospital with three other, definitively unstable inmates. The sheriff is out to avenge his daughter's death and rounds up authorities to go on the hunt for the escapees. The leads to a violent road trip that turns this member of the family into the killer we all know from the original Texas Chainsaw Massacre. This trailer gives us quite a bit more to chew on than the initial red-band trailer did. We get glimpses of the actual mental hospital, notes of the conflict between the Sheriff and the Sawyer family. Plus, the opening sequence is pretty cool. 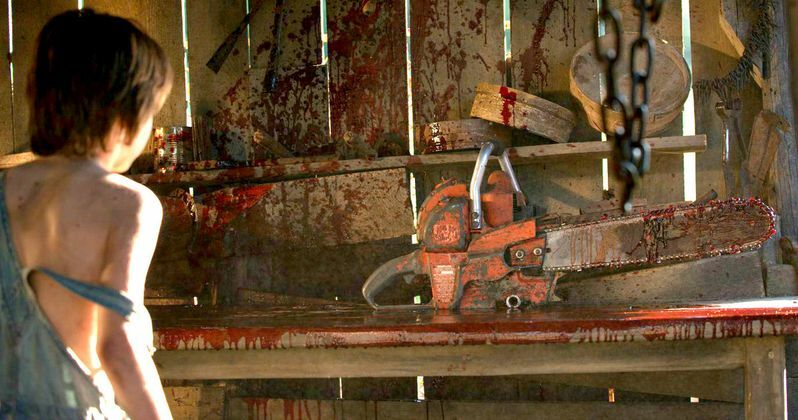 The first teaser for Leatherface was really just a bunch of glory shots and a whole bunch of blood. It earned the red-band tag, that's for sure. Save for the idea that exploring the known as Leatherface could sort of unravel the mystery a bit too much and take away a bit of what was special about Tobe Hooper's original Texas Chainsaw Massacre, this does look to be an effective horror movie. It usually isn't a very good sign when a movie sits on the shelf for a long time before getting a release, but none of the marketing for Leatherface so far has made it seem like this movie is in any way a disaster. We'll know soon enough. Leatherface is written by Seth M. Sherwood and directed by the Julien Maury and Alexandre Bustillo (Inside). Be sure to check out the brand new trailer for Leatherface for yourself below.